New Book: Art at the Speed of Life | Paint. Draw. Blend. 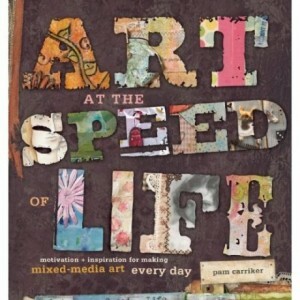 I just received a copy of Pam Carriker’s new book “Art at the Speed of Life”. And I have to say, it certainly lives up to its subtitle: “Motivation and Inspiration for Making Mixed-Media Art Every Day”. This book is not only packed with great mixed media projects, it also includes inspirational advice on how to fit art into a busy schedule on a daily basis, including suggestions on setting up a workspace along with managing multiple art projects. Pam shows among other things how to create a handmade art journal and how to use a multitude of art materials to create a variety of mixed media projects, including a PanPastel project. Also included are several essays from other well-known mixed media artists including Nancy Lefko, Suzy Blu, Paulette Insall and Seth Apter. Definitely worth checking out if you are looking for some creative inspiration and motivation!